Xenics introduces the XTM-640 uncooled thermal OEM module with unique image quality and stability for a broad range of OEM applications including security, night vision, firefighting, airborne and land-based reconnaissance, and surveillance. This module comes in 16bitDV, BT.656, analog, CL, and GigE models. 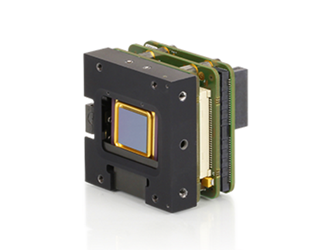 This extremely compact and versatile camera module ensures unparalleled uniform and crisp images with the onboard image processing and full shutter control. The 17 µm pixel pitch guarantees excellent Detection, Recognition, and Identification (DRI) values for the most critical security applications. The XTM-640 is also easily integrated into any system with its standard interfaces (16bitDV, Bt.656, analog, CameraLink or GigE Vision) which substantially accelerate the time to market for the users' products. Xenics guarantees a high operating temperature range and unparalleled uniform and crisp thermal images thanks to its on-board image processing and full shutter control. The XTM is reaching an increased level of image detail with the newly developed Xenics Image Enhancement (XIE) algorithm that has been launched on all of Xenics’ bolometer cameras. XIE exists of a number of image enhancement filters which are used in combination with histogram equalization. For more features, specifications, and OEM applications, download the brochure. Visit the webpage for more information on the different types of models.